The Great American Eclipse, as it’s being called, is a solar eclipse that will occur over the United States mainland on Monday, August 21st. It will be a total eclipse that will be viewable to some degree across the entire country and will follow a path heading southeast, starting in Oregon and ending in South Carolina. It will first be visible in Oregon at 9:06 AM, PST, and will last be visible in South Carolina at 4:06 PM, EST. 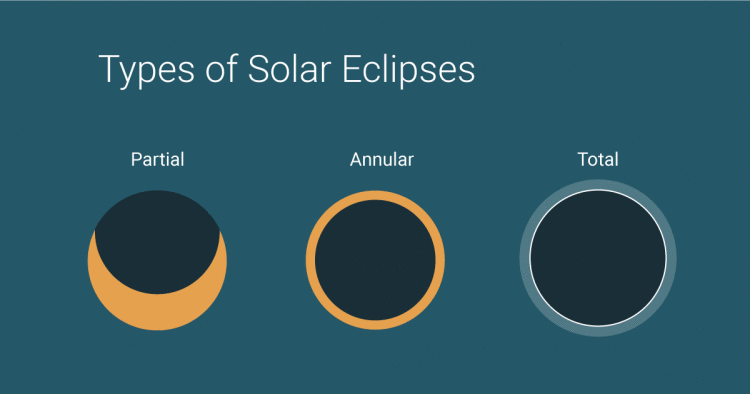 The basic types of eclipses. A solar eclipse is an astronomical event where the Moon passes between the Earth and the Sun, casting a dramatic shadow on the Earth’s surface and blocking out all natural light, turning day into night. This particular eclipse is significant because it is rare for a total solar eclipse to cross the entirety of a country as large as the U.S. The U.S. is also the only country on Earth that will be able to see the eclipse in its totality, meaning the Moon will pass directly the Earth and the Sun, fully covering the latter. Other countries will be able to see it, but only partially. Canada will have the second best seat to the eclipse, with citizens of Victoria, British Colombia, being able to see the eclipse at 89% totality. People of Chukchi, in eastern Russia, will see the eclipse at 40%. At the end of the day, the people of western Europe will be able to see only a partial eclipse at sunset, where the Moon will only cover the edge of the Sun. All other areas of the world wouldn’t even know an eclipse took place. For this reason, many in the U.S. are making plans to view the solar eclipse in some way. Many Americans’ towns have the luck of lying directly in the path of totality, but even greater numbers of people are flocking to these areas. There have already been significant logistical problems with many rural or small communities being unable to handle the influx of people. Some have even taken advantage of the situation by selling counterfeit eclipse glasses, which one needs in order to safely view the eclipse. It seems difficult to find accommodations in towns at this point, so why not head out into the wilderness to view this spectacular event? This week’s Map of the Week can help you with just that. 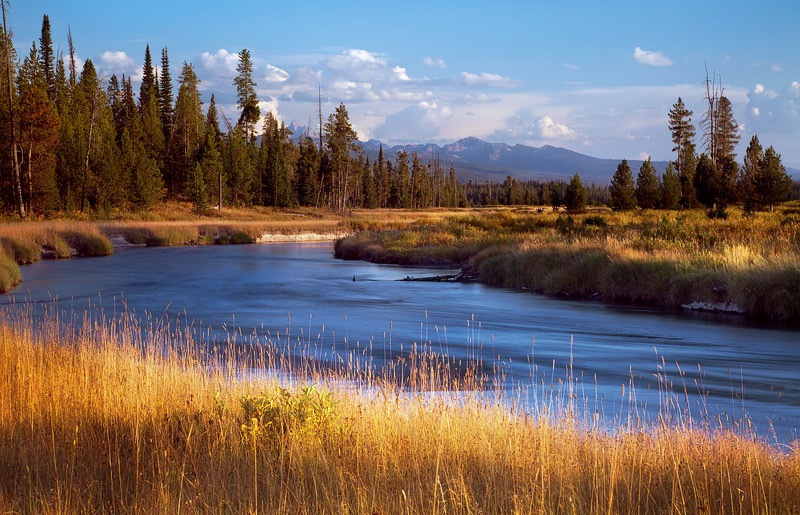 Yellowstone is just one of many U.S. National Parks and Forests that will witness the solar eclipse. Is there any way to better experience the solar eclipse than surrounded nature? 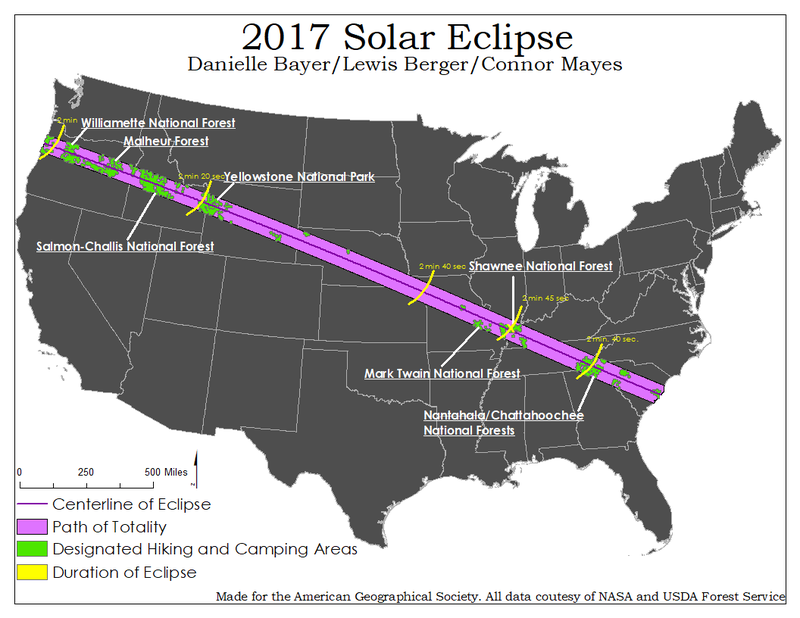 We at AGS thought not, so we mapped all the official camp grounds, hiking trails, and park lands that lie in the path of the total eclipse, shown on the map in green. As the map shows, there are significantly more designated hiking/camping areas in the western and eastern United States, with not much in the Midwest. That is not to say that there are no nice, natural areas to visit in Nebraska, just that there are no nationally recognized outdoor recreational areas. However, even the places along the path of totality are not entirely equal. In yellow, we have marked how long the eclipse will last over a given area. On the Oregon coast, the total eclipse will be viewable for two minutes exactly. This time will increase in duration as it crosses the country. The maximum duration will be over southern Illinois, near the Shawnee National Forest, and will last for two minutes and 45 seconds. It will then decrease in duration, and will about 2 minutes and 30 seconds on the South Carolina coast. The eclipse will pass over 11 states, and will just barely miss the corners of 5 others. Even if you cannot travel to the path of totality, we still recommend everyone go outside to see the eclipse. The solar eclipse will be viewable from everywhere in the contiguous U.S., and spectators in these other areas will be in what is called the penumbra and will see a crescent-shaped eclipse. The next time a total solar eclipse will be able to be seen in the U.S. will be 2024, so be sure to see Monday’s eclipse no matter where you are! Please be safe when looking at it, as looking at a solar eclipse without special glasses can permanently damage your eyes. Enjoy this phenomenal astronomical event!